Gaajuran won the toss and elected to bowl first. Reading’s opening pair Ashwin and Raheel soon had Shinfield in trouble. 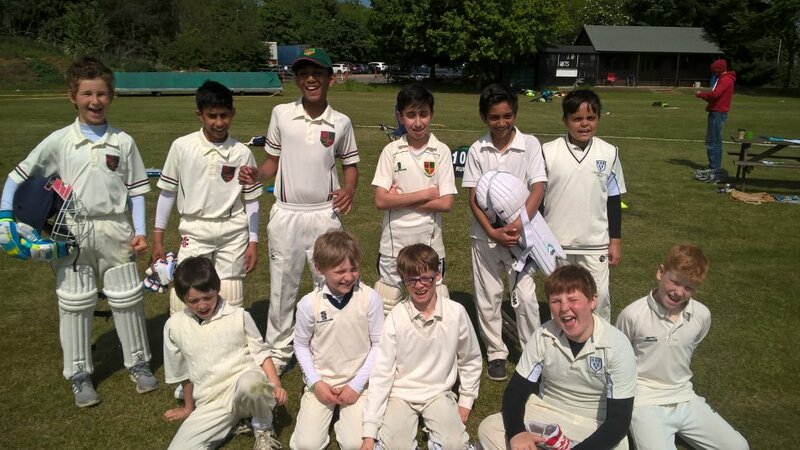 Ashwyn bowled Aditya the Shinfield opener with the fifth ball of the match. Raheel’s opening over was even more spectular with him claiming 2 wickets with the first 2 balls – one caught and bowled, and the second sending the stumps flying to leave Shinield tottering on 4-3. Yakhoub (an ex Reading player) and Devanch then staged a decent recovery in the face of good bowling by Gaajuran, Matthew, Jibran, Ajmal and Nathan. Eventually the pressure told when Devanch was out stumped with great work by Aarav who beat him in the flight and Henry who completed the stumping. Yakhoub was also run out shortly afterwards. Despite wickets for Ezra and Varad who both had their victims out bowled, Shinfield continued to bat well, particularly Jihan who finished not out on 25 to take Shinfield to a total of 103, which was a decent effort considering the number of early wickets. Raheel and Aarav opened for Reading with great calm, running lots of quick singles and byes, as well as punishing the occasional bad ball. Both did well to retire not out (Raheel on 25 and Aarav on 26). Gaajuran then came to the wicket and blasted a quick-fire 26 including 5 fours. Ashwyn and Matthew then finished the job with solid batting and good running to help Reading pass the Shinfield total with seven and a half overs still remaining. This was a very good performance, with the only slight criticism being the large number of extras conceded – easily Shinfield’s highest score. Overall a good finish to a very good season. I have been proud to manage this very talented, polite , respectful, and enthusiastic group of young cricketers. All have worked hard to improve and I hope they have all enjoyed the season as much as I have. I will look to publish a more detailed end of season report before the summer holidays.